PlaneSense, Inc., a leading fractional aircraft ownership program, welcomed the arrival of the world’s first Pilatus PC-24 jet at its headquarters in Portsmouth, New Hampshire today. As the launch customer of the PC-24, PlaneSense is expecting a total of six jets by end of 2019, the largest order received by Pilatus in its current order book. The highly anticipated jet will serve as the signature aircraft in the PlaneSense jet fleet. The PC-24 departed Switzerland on January 30 for its ferry flight to the Pilatus U.S. facility in Broomfield, Colorado. The aircraft was officially handed over to PlaneSense yesterday prior to its departure for Portsmouth. PlaneSense celebrated the arrival of the first PC-24 with an employee-focused event followed by an event with industry leaders. 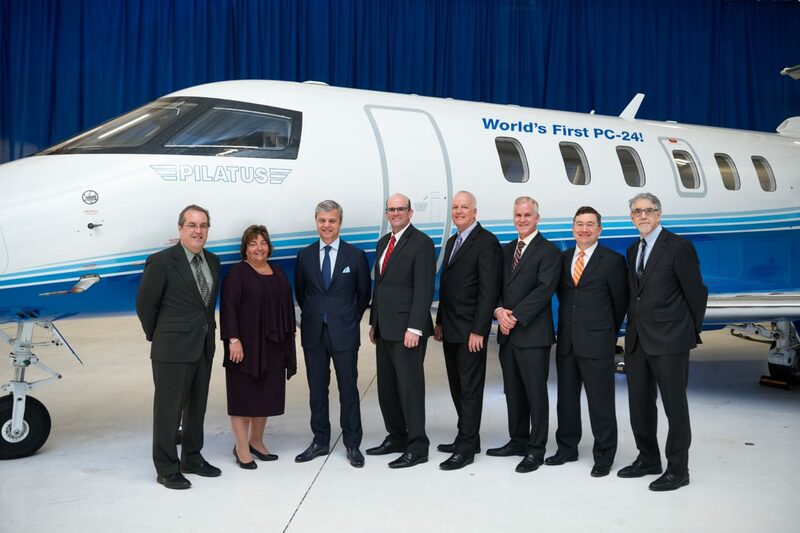 Guests included executives from Pilatus, Williams Engines, and Honeywell. The first PlaneSense customer flights on the PC-24 are expected to begin in mid-March. PlaneSense looks forward to the delivery of the remaining five aircraft over the next two years. Of the four PlaneSense pilots to complete their training at FlightSafety International in Dallas, Texas last month, two became the first in the world to receive a commercial PC-24 type rating on January 26th. They also took part in the ferry flight from Switzerland to the U.S. In total, eleven PlaneSense pilots will train to fly the PC-24 in the first quarter of 2018, with another dozen slated for training throughout the year. Four mechanics also just completed the very first mechanics training class at FlightSafety International. These technicians will also undergo additional training at the Pilatus factory in February.